Ah, life on the “blue” roads. You get to see things otherwise missed. 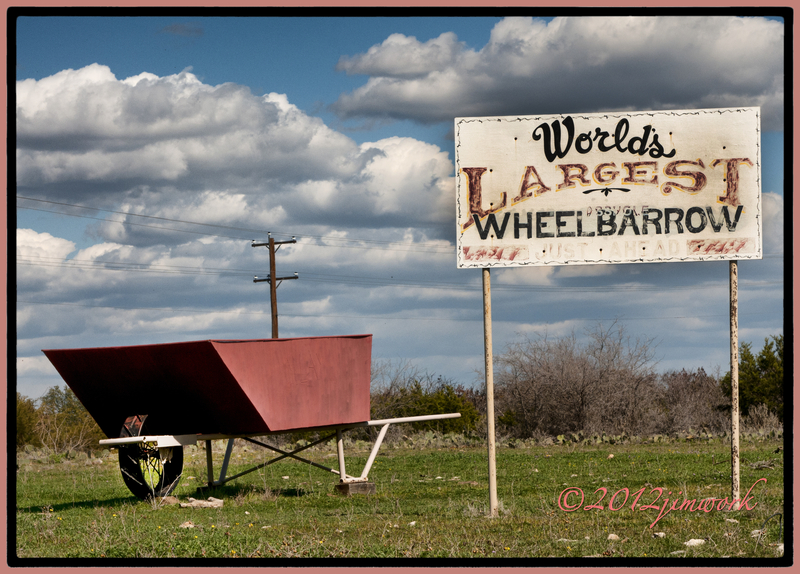 Like the world’s biggest wheelbarrow. Who is going to doubt such a claim? We felt just a bit like Frank Quinlan, Dorothy Winters, Huey Driscoll traveling along with “Michael” heading for the world’s biggest ball of twine. We got to see a Cooper’s hawk hopping across a green field dragging a wild eyed cotton-tail rabbit for lunch, a couple of ladies using a garden hose to wash a small pony in their front yard, and old style “Burma Shave” style signs leading us into Albany, TX. We might not of had John Travolta with us, but we had an angel riding along. I, like Michael, love to seek out these things in the world. Thanks for sharing!